A brilliant collection of critical essays by a young writer who is already a star in the intellec­tual firmament. As William Deresiewicz has written in Harper’s Magazine, “[Mark Greif] is an intellectual, full stop...There is much of [Lionel] Trilling in Greif...Much also of Susan Sontag...What he shares with both, and with the line they represent, is precisely a sense of intellect—of thought, of mind—as a conscious actor in the world.” Over the past eleven years, Greif has been pub­lishing superb, and in some cases already famous, es­says in n+1, the high-profile little magazine that he co-founded. These essays address such key topics in the cultural, political, and intellectual life of our time as the tyranny of exercise, the tyranny of nutrition and food snobbery, the sexualization of childhood (and ev­erything else), the philosophical meaning of Radiohead, the rise and fall of the hipster, the impact of the Occupy Wall Street movement, and the crisis of policing. Four of the selections address, directly and unironically, the meaning of life—what might be the right philosophical stance to adopt toward one’s self and the world. 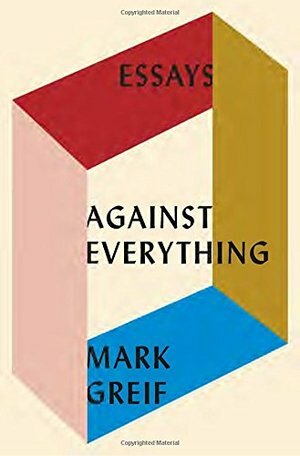 Each essay in Against Everything is learned, original, highly entertaining, and, from start to finish, dead se­rious. They are the work of a young intellectual who, with his peers, is reinventing and reinvigorating what intellectuals can be and say and do. Mark Greif manages to reincarnate and revivify the thought and spirit of the greatest of American dissenters, Henry David Thoreau, for our time and historical situation.